Rock stars – or, at least, wannabe-rock stars – will tell you Keith Richards is the most interesting member of The Rolling Stones. Don’t listen to them; it is, and always has been, Mick Jagger who is the most intriguing, most complex, member of the self-styled “world’s greatest rock ‘n’ roll band”. This latest biography by Phillip Norman, author of highly-respected studies of both The Beatles and The Rolling Stones, tells us why. As a middle-class teenager from Kent drawn to the sound of the Delta and Chicago blues; as an intelligent and cerebral man making a living from his vocal expressiveness and his raw physicality; as an inveterate social-climber, a natural conservative and an early health freak, who found himself as a poster-boy for ‘60s revolutionary-protest chic and ‘70s hedonism – at every stage Mick Jagger has lived a life full of contradiction. Norman shows us the man who can write an historically-rooted epic such as “Sympathy For The Devil” (1968), but who is apparently unable – or unwilling – to recall his own past after signing, and then cancelling, a £1m deal to pen his memoirs. He also brings us the notorious lothario – father of seven children with four different women – who is simultaneously capable of producing such paeans to desire, longing and regret as “Wild Horses” (1971). Norman’s Jagger is also that man who smothers any expression, or even hint, of genuine feeling in an Americana of his own invention (what Norman refers to as his “Noo Awleans” accent and persona). This Jagger is a slippery, evasive, character – a chameleon changing his colours to suit. He would have made a fine courtier at the Palace of Versailles – fawning and charming, ambitious and scheming. Ultimately, for Norman, that is, in a sense, the point. Jagger is a man of such intelligence, charisma and wit, that he would have been a success in any field he chose. Instead, having conquered the rock ‘n’ roll world by the age of 30, he spent the 40-years since as nothing more than a kind of ersatz tribute act to his own blistering youthful triumphs. He could, and should, have achieved so much more. But, with his wealth, his women, his wine, his song – and, yes, his “satisfaction” – should he even care what might have been? 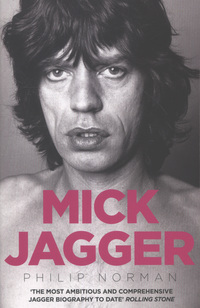 This fine and supremely well-researched biography, then, is Mick Jagger in all his lived complexity: can’t you hear him knocking? This entry was posted in Book Reviews and tagged Biography, Book Reviews, mick jagger, philip norman. Bookmark the permalink.